Alex Adam Podiatry > Blog > Corns and Callus – Why Do they Occur? Quite frequently at AMA Podiatry, patients are presenting with corns and callus which are often wrongly accepted as factors of everyday life. It is important to say that not all corns and callus are symptomatic, with many patients presenting to the clinic for other pathology with these problems being incidental findings. Despite the common nature of these dermatological conditions there is always a reason as to why you have them, and why it is important from a podiatric perspective to determine cause, and to prevent re-occurrence. The important part of any corn our callus treatment is to understand the difference between the two presentations and the aetiology, or cause behind them. Clinically this is referred to as HYPERKERATOSIS and is the build up of terminally undifferentiated keratinocytes (cells in the epidermis of your skin) causing thickening of the stratum corneum (outer most layer of the epidermis). These cells are dead, with no neurological or vascular innervations and are typically built up by REPETITIVE SHEARING FORCES whilst weight bearing or loading. That is why you can predominantly find callus on your hands and feet. 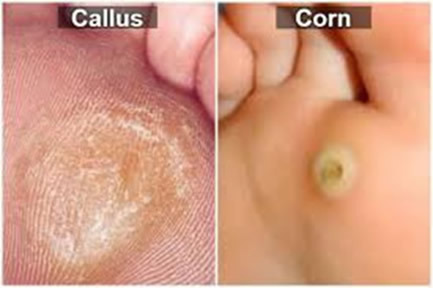 s with callus, corns are comprised of these dead cells however they arise from REPETIVE ROTATIONAL FORCES resulting in the formation of a nucleus, or core which penetrates your skin like a splinter. Quite often there will be overlying callus and as such hide the presence of a corn. Clinically corns can present differently and are named to correspond. Corns can be identified as being heloma durum (hard corns), heloma miliare (seed corns) and heloma molle (soft corns). The reasoning behind this response is that most callus and corns have a BIOMECHANICAL aetiology resulting in these mechanical pressures being generated on and around the feet. A decreased range of motion, weak muscles or tendons, poor walking gait patterns or injury can increase plantar pressures. It is also important that we don’t assume all biomechanical issues originate from the feet. As such a full skeletal assessment that covers the feet, ankles, knees, hips and upper body is required for correct clinical treatment. Assessment of all footwear is also required as the platform that you stand on can greatly influence your biomechanics, both positive and negatively. A prime example in relation to corns is the regular use of high heels which alter the kinetics (measurement of forces and moments exerted on the body) and kinematics (measurement of motion) throughout your feet substantially. The structure of your foot is not made to be held in a position and actively facilitate ground forces across joints in most high heel shoes. This scenario typically increases plantar forefoot pressures and produces rotational forces resulting in both hyperkeratosis and heloma durum formation. If this is the case your podiatrist will work with you to find shoes that you both are comfortable in, but also beneficial to maintaining your lower limb health. In my second blog, we will look at patients who are more at risk of developing corns and callus, what complications can occur and treatments available.